The boss battles contained in each Metroid game are one of the franchise’s staples, their challenging but not impossible design sitting as some of the highlights of each installment. 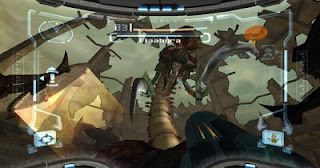 Metroid Prime’s bosses are no different and follow the tradition of offering some intensity to the isolated adventures of Samus Aran, not to mention ensuring that the skills learned prior to each battle and the abilities obtained throughout the game are utilized in an effective manner. Combining organic creatures already native to Tallon IV and those created or influenced by the strong presence of the Space Pirates and their operations, the boss battles in Metroid Prime contrast nicely with the otherwise lonely journey of the game to create its diversity whilst simultaneously also appearing to enhance the game’s narrative, themes and overall outcome. Ranging from mutated (not to mention enlarged) creatures such as the Parasite Queen found on the space frigate Orpheon, to the giant, lumbering beast that is the Omega Space Pirate, each battle and each foe offers something new and distinct from what has been seen previously whilst also continuing the trend of more difficult and menacing foes as the player (and thus, Samus) progresses. What this means overall is three different things: first, the chance to test and master the skills that have been formed over the course of the game; second, moments to look forward to after long sessions of exploration and loneliness; and lastly, a change of pace (and intensity) after slow, gradual progress and enemies that pose little to no problems. It’s about challenge and strategy but not at the expense of progress or the other key elements that make up a Metroid experience, namely the exploration and discovery. Interesting, too, is the way in which these battles take place -- and, perhaps more importantly, why. Right from the very beginning of the game, as players gently ease themselves into the 3D, foreign feel of a Metroid title viewed from Samus’ own eyes rather than from a side-on perspective, a boss battle exists, designed to teach a skill that will become key later on in the game: that of strafing from left to right (or vice versa) to avoid enemy fire. The battle is simple in that there’s hardly any strategy to defeating the Parasite Queen, with quick, rapid blasts or powered up singular shots from Samus’ beam cannon making quick work of the easy opponent. In fact, the only challenge the battle poses is from a spinning force field that protects the queen, but it has enough holes in it that it’s not a problem -- if there’s no gap, you don’t shoot, simple. 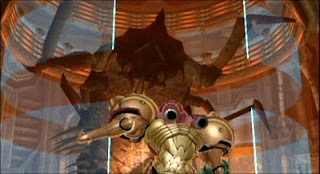 Samus staring Flaahgra down in the first major boss battle of Metroid Prime. Contrast that with Flaahgra -- the mutated plant boss found in the Chozo Ruins and the source of the poisoned water that posed a small problem in traversing the remnants of a lost civilization -- who does offer a challenge and requires some strategy in order to attack. Not only is strafing important in avoiding Flaahgra’s acid attacks, confidence with locking onto the solar panels that is providing sustenance to the enlarged plant is key to efficient success as, later on in the battle, Flaahgra can knock them back down with one of its many stems. The goal of the fight is to knock the solar panels away so the sun’s rays are no longer providing energy to the plant boss, causing it to collapse with exhaustion and its tentacles to retract, allowing Samus to quickly morph into a ball so she can slip through the tunnels that were previously blocked and let off a morph ball bomb in the mechanical slot -- a technique learned prior to the battle not long after the ability was acquired -- in order to deal damage. Rinse and repeat the process -- a staple of Nintendo’s library of games and certainly not exclusive to the Metroid series -- and before long Flaahgra is down, alleviating the problems of a contaminated area by allowing the water supply of the Chozo Ruins to become clean and pure once more. Future bosses provide even more complexity and challenge, the Omega Pirate and Metroid Prime itself standing out as the game’s most difficult boss fights, but regardless of whether it’s at the start of the game or at its end, the bosses in Metroid Prime serve a purpose in teaching, using (abilities) and changing (the game's pacing), even if only for a short period of time. They’re fun distractions more than anything else, but the lessons learned in fighting these monsters go on to serve the rest of the game, and in doing so only enhances the experience rather than hinders it. It’s a shame other games can’t get this process right more often, not to mention as elegantly as Metroid Prime does.